Title: Peter Mattei: Great Baritone Arias Artist: Wolfgang Amadeus Mozart Genre: Classical|Vocal Format: SACD No. of Discs: 1 disc(s) Studio / Label: Bis UK Release Date: 26 Apr 2011. This is a hybrid SACD so it will play on any CD player but sounds best on a player that can read the high resolution SACD layer. The disc has a couple of marks on it that does not affect play. It is complete with the OBI as shown. This is a single layer SACD so it requires a player that can read the high resolution SACD layer. This is a single layer SACD so it requires a player that can read the high resolution SACD layer. It is still sealed. Fone SACD 056. Hybrid SACD. Mozart - Violin Concertos K. 207, 211 & 218 & Rondo K.373. still factory sealed original first audiophile Italian stereo edition from 2011. condition: new, still sealed. - to any place in the world. Format: SACD. Sonata for violin & piano No. 24 in F major, K. 376 (K. 374d): 1. Allegro. Sonata for violin & piano No. 24 in F major, K. 376 (K. 374d): 2. Andante. Sonata for violin & piano No. 24 in F major, K. 376 (K. 374d): 3. Wolfgang Amadeus Mozart : Mozart: Piano Concertos CD (2011)Title: Mozart: Piano Concertos Artist: Wolfgang Amadeus Mozart Genre: Classical|Concerto Format: SACD No. of Discs: 1 disc(s) Studio / Label: Bis UK Release Date: 04 Jan 2011. RCO : Mozart : Requiem : Mariss Jansons. 2011 RCO Live 14002. Original SACD in Super Jewelcase. SACD is in very good to near mint condition. Booklet and back insert are in excellent condition. CD case has normal signs of use. Of Discs: 1 disc(s) Studio / Label: Linn Records UK Release Date: 17 Oct 2011. 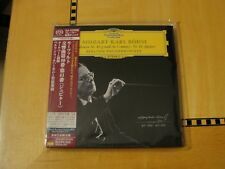 Disc 1 2 Allegro. Disc 1 11 Adagio. Disc 1 13 Rondo Allegro. Disc 1 14 Allegro. Disc 1 15 Adagio. Disc 1 16 Rondeau Allegro. Title: Mozart: Piano Concertos. Genre: Classical. Sub Genre: Concerto. Condition: New. Catalogue Number: MDG9401667. Format: CD. Title: W. A. Mozart: The Violin Concertos. Genre: Classical. Sub Genre: Concerto. Condition: New. Format: CD. Release Date: 2011-03-21. Genre: Classical. Sub Genre: Chamber. Catalogue Number: PTC5186190. Number Of Discs: 1. Condition: New. Format: CD. Format: SACD. Title: Piano Quartet Op 25 / Piano Quartet Op 47. Artist: Mozart Piano Quartet. Genre: Classical Composers. Title: Mozart: Piano Concerto 15 / Symphony 36 Linz. Format: SACD. Genre: Classical Artists. Format: SACD. Artist: Julia Fischer, W.a. Mozart. Title: Violin Concertos. 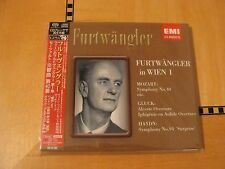 The set also includes her recording featuring The Sinfonia Concertante for Violin, Viola and Orchestra in E flat, K. 364, as well as a bonus DVD with exclusive video from Fischer's recording sessions. Title: Mozart: Piano Concertos. Genre: Classical. Sub Genre: Concerto. Condition: New. Missing Information?. Catalogue Number: 0760623166766. Format: CD. Title: W. A. Mozart: The Violin Concertos. Genre: Classical. Sub Genre: Concerto. Missing Information?. Condition: New. Format: CD. Genre: Classical. Sub Genre: Chamber. Missing Information?. Condition: New. Format: CD. Genre: Classical. Sub Genre: Chamber. Catalogue Number: PNTA5186190SACD. Number Of Discs: 1. Condition: New. Missing Information?. Allegretto 1-6 Allegro 1-7 String Trio in B Flat Major, D471. Genre: Classical. Sub Genre: Chamber. Condition: New. Further Details. Format: CD. Release Date: 2011-01-04. Allegretto 1-6 Allegro 1-7 String Trio in B Flat Major, D471. Genre: Classical. Sub Genre: Chamber. Missing Information?. Condition: New. Format: CD. 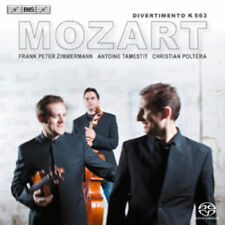 Title: Mozart: Piano Quartet/Brahms: Piano Quartet, Op. 25/. Genre: Classical. Sub Genre: Chamber. Missing Information?. Condition: New. Release Date: 2011-11-14.